You know, asking for directions is inevitable if you are driving around a place you aren't that familiar with. Unfortunately, doing it over and over again may somehow become quite an annoyance and it'll feel tiring, too. This is probably why street signs were built in the first place. However, street signs are not always easy to read, especially if you are driving at night. In order to see what is written on a street sign at night, it is often the case that drivers have to slow down their car or even pull over and take a close look at the sign. Nevertheless, thanks to the evolution of digital technologies these days, drivers may no longer have to deal with such cases as mentioned earlier. This is especially true if the countries in the world finally start using 'Points'. 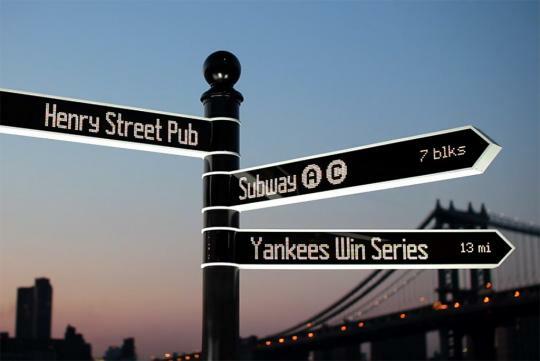 It's a digital street sign developed by Breakfast Products. It took the company no less than three years to be able to build such an impressive device. Yet, the result is, well, quite impressive indeed if the sign works just as it's advertised. 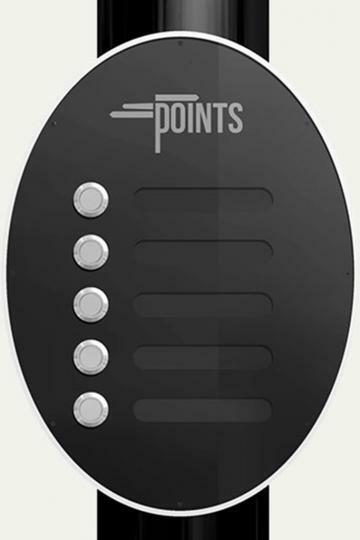 'Points' has a pole that is about as tall as a human being where it displays a five-segment interface menu. This menu is continuously updated by utilising an internet connection. 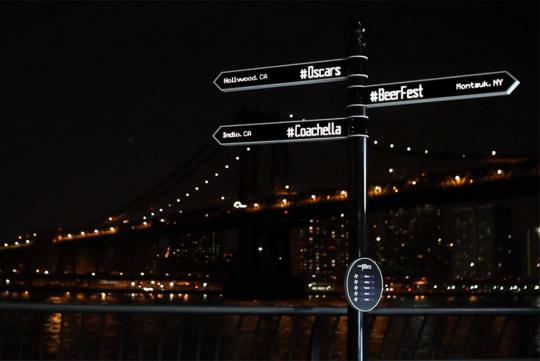 This digital street sign fetches data from a number of onboard sensors in addition to social networks such as Foursquare, Twitter, and even RSS feeds, among others. Then, based on the data, 'Points' will display information on its three directional arms. Seeing the directional arms in motion, I believe some of you may wonder if the electrical wires inside them will be tangled. Well, as Breakfast Products takes advantage of rotary electrical interfaces and micro transmissions (consisting of 11 gears as well as multiple motors), tangled wires are really nothing to worry about in the case of 'Points'. As a matter of fact, the arms can swing smoothly up to 360 degrees regardless of how bad the temperature or weather may be at any given time. Additionally, this digital street sign also uses a processor which can remain cool most of the time, preventing the power from being drained quickly. Oh yeah, did I mention that 'Points' is mostly made of aluminium? Aluminium is chosen for the sake of durability and strength in a diverse set of environments. Earlier, I mentioned that drivers would possibly no longer have to slow down or pull over to read street signs, didn't I? Well, this is very possible because 'Points' utilises over 16,000 ultra-efficient and super bright LEDs. So, even during the night, you'll be able to clearly see what's displayed on this particular digital street sign. Although 'Points' is made in America, hopefully it makes its way here to Singapore as well.